Then I’d pour a glass of wine, pick at my cuticles, and contemplate where I went wrong with my life. So after another come to Jesus meeting with myself about the state of our home, family, and how it all functions, I busted out my most inspiring cookbooks and heavily planned the food for the days ahead. Proper Planning Prevents Poor Performance. Or so I’m told. We spent Saturday morning walking around the Farmers Market, where I happily purchased plums, a gigantic box of pears, four loaves of bread, and some bell peppers (I’ve already harvested all of mine!). I then went to the regular store where I restocked on cacoa powder, salt, cheese, oats, dried cranberries, nuts, tea, and (of course) bananas. Last but not least: corn meal and polenta. So I grabbed a banana. And then I grabbed my cornmeal. I wanted corn bread, dripping in melted butter and honey. Because… well… butter and honey. It took me all of five minutes to whip together this einkorn cornbread and was golden and fragrant by the time the groceries were finished being unpacked. I ate three pieces, Stuart and two, Georgia ate four, and the boys ate half of theirs before the dog snatched the remainder out of their hands. I’ll still count it as a culinary victory. I used einkorn flour because it’s my favorite and suits itself extremely well to this crumbly, golden, buttery recipe. But a sprouted flour, whole grain flour, or organic all-purpose flour would be an easy substitute. Combine the cornmeal, flour, sea salt, and baking powder together in a bowl. Start to get excited about all the delicious cornbread that is about to consumed. In a separate bowl, combine the maple syrup, egg, milk, and melted butter. Whole cane sugar or honey would also work fine here if maple syrup ain’t your thing. Ah, who am I kidding, maple syrup should be everyone’s thing. Hello! It’s maple syrup! Pour the liquid ingredients into the dry ingredients and gently whisk to combine. Don’t overmix, baby. That’ll affect the crumb of the cornbread and as all cornbread connoisseurs know, the crumb is a very important factor. Pour into a greased 8” pan. Mo butter, mo better. Bake in a preheated 425 degree oven for 18-20 minutes, until golden and gently browned on the top. Can I be just super honest and tell you something about myself? See that piece of cornbread in the picture above? See how one corner of it is rounded? Know why that is? Because it’s the corner piece and from now until I die, I shall always choose the corner piece of something if I have the option to. Cornbread. Brownies. Souffle. Corner piece 4 life. 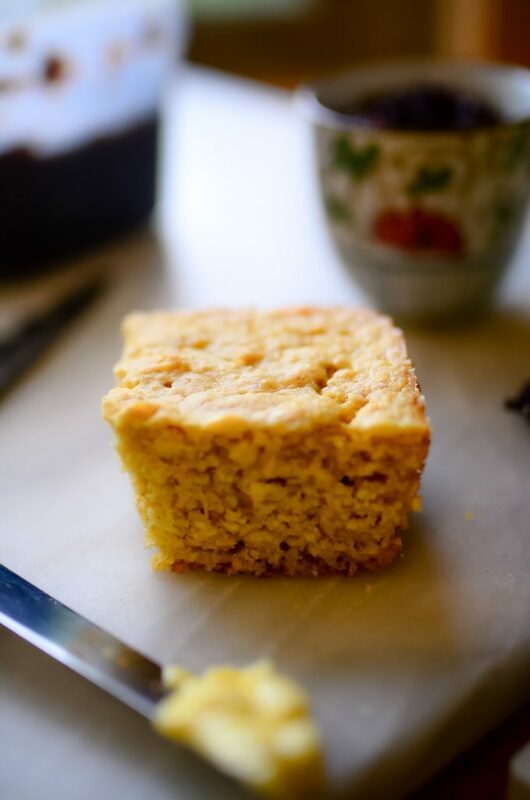 I know you enjoy this einkorn cornbread as much as we do! I’ve already made several batches… one shan’t ever be too long without it. 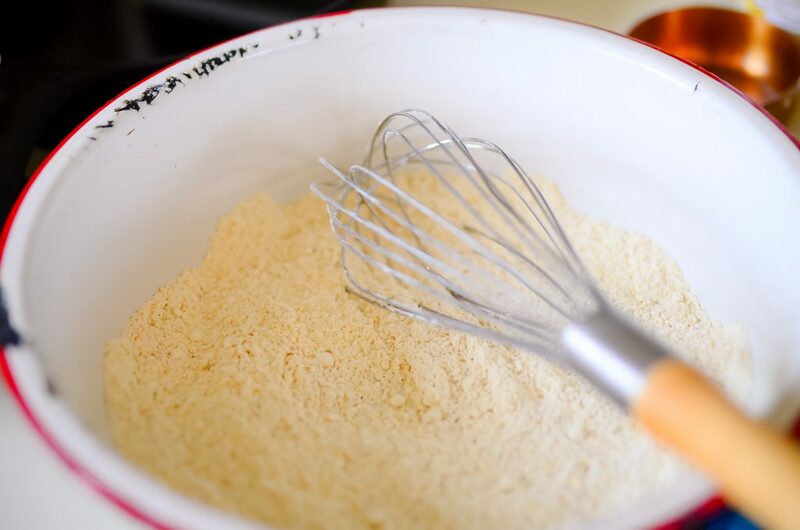 Combine the cornmeal, flour, sea salt, and baking powder together in a bowl. 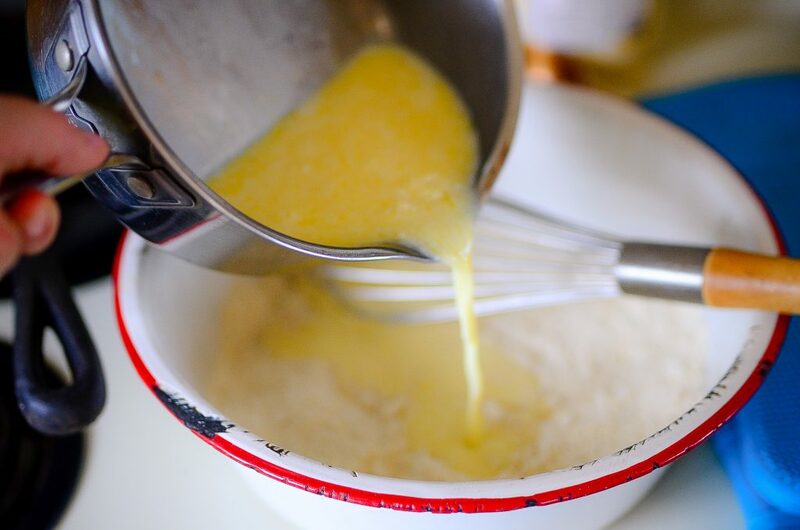 In a separate bowl, combine the maple syrup, egg, milk, and melted butter. Pour the liquid ingredients into the dry ingredients and gently whisk to combine. Don’t overmix, baby. Pour into a greased 8” pan. « Coffee with my friend. I just woke up and am looking through Facebook. 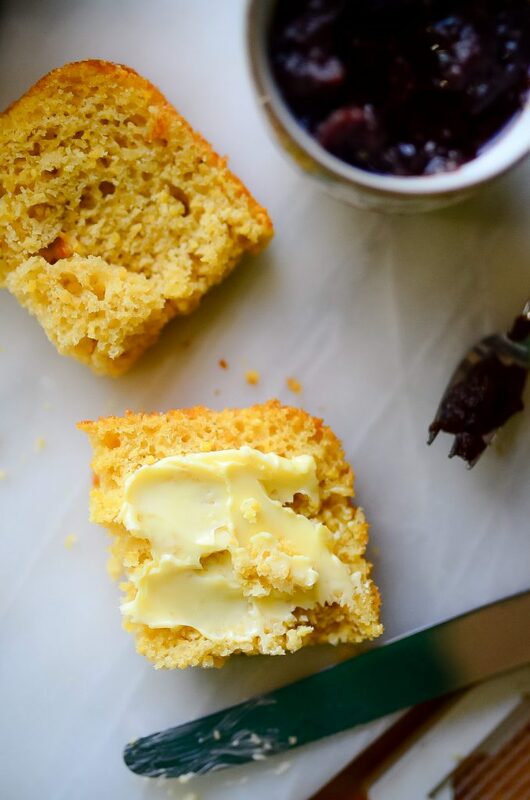 I read this recipe and now I want cornbread for breakfast. LoL. I like to make it in a cast iron skillet. I’ve never made it with honey. I imagine it adds a nice sweetness…… instead of sugar. Welp. I don’t have the ingredients to make cornbread so I guess I’ll have to settle for eggs and ham. Oh Shaye. Thank you. Thank you for letting us know you do the exact same things we do. Good for a while, then life goes sideways for a while. And thank you for the dirty egg. That’s how my eggs look, and I am happy with them. My friends, family? Skeeved out. 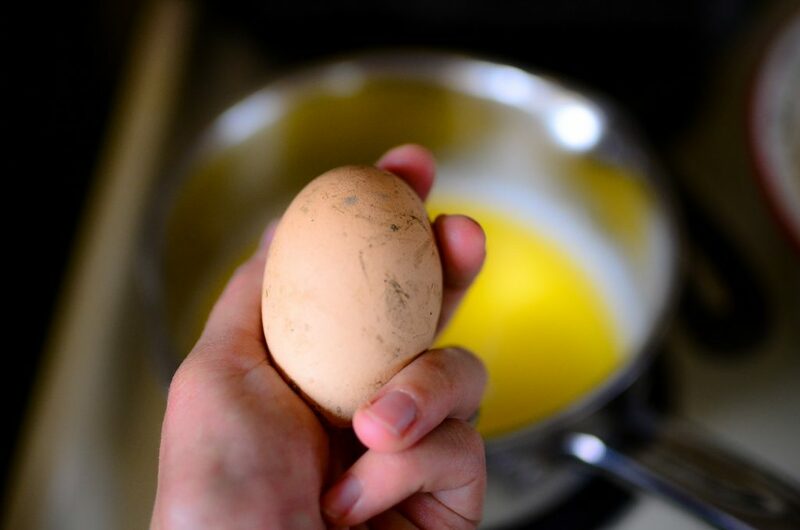 We need to change what people think a good egg looks like. I can’t wait to try this recipe. I Love cornbread. Thank you for that too. I started using Einkorn a few weeks ago and it’s LOVE!!! I don’t – yet 😉 Try sifting it a wee bit? I know the amazon link is great for the flour, but where do YOU buy it? Is it an Azure standard thing? I’d love to buy it more in bulk, there’s got to be a cheaper option to start getting great flour. That Amazon link is a great price for it in bulk, in my opinion. I pay over $7 for a 32 oz bag in the grocery store (2 lbs). The Amazon price is $33 for 10 lbs (and free shipping). I know some outlets online sell the 32 oz bags for cheaper (Lucky Vitamin has for $5.67 right now, but you have to spend $49 for free shipping). Jovial also sells their 10 lbs bags on their site for $33, and if you buy 2 they will lower the price to just $30 and I believe they also offer free shipping. Hey Shaye! So I am just learning about einkorn flour. Do you ever sprout or ferment it? Like when making bread? Your link is to regular einkorn flour, so I was confused because I know you usually sprout and ferment grains. Thank you for this great recipe! Wow! This cornbread is delish! I had to wait till my Einkorn flour arrived in the mail . . . and the wait was worth it. Thank you for this recipe and for all the other great recipes (and news from your heart) that you share. The dough was a little spongy — then I looked back at your photo and saw the same texture in your pan. Thanks for the great photos, too. Blessings on your sweet little head — and on all the sweet little heads at the Elliot Homestead. I loved this! I tweaked it a bit by using masa and einkorn and replacing the cup of milk with raw kefir. I mixed the flours with the kefir and let soak overnight before mixing everything else and baking. Slathered with raw butter…amazing!!! I just made this and it was awesome! Normally, I don’t really crave cornbread because in the past they taste like sawdust. But this was moist and yummy! Thanks so much. This was a good recipe. I doubled it and used a cast iron pan. Cooking time was about the same though for my oven. I was out of maple syrup at the time so I used mostly molasses and a little honey. It was very good. If someone wanted it sweeter (it’s not noticeably sweet), increase the syrup or whatever sweetener you use. This is not a very sweet corn bread which allows everyone to sweeten or salt to their own tastes. Thank you for the recipe! My 8 yr old loves this cornbread recipe. When I make it she tells me I’m the best cook ever. Thanks Shaye! Also I use sprouted corn flour and it turns out great. I too only bake with weighed ingredients. If this helps, Jovial says one cup of Einkorn is 120 grams. The author to this recipe has not responded to the best of knowledge.